Greetings, friends. As summer finally comes to a close we can't help but turn our sights to continued sunshine and warm weather... the Caribbean. Yeeeehah!!! We've begun booking "Baked in the Sun" Tour 2004. Our annual tour of the U.S. and British Virgin Islands is scheduled to kick off on Glen's birthday, January 2. After return visits to St. Thomas, St. Croix, St. John and Tortola (28 shows total), we'll wrap up on January 28just in time to return to the States to celebrate our 18th year together as a band. It's also a fine occasion to release a new studio album, our first since Coral Bay (2001 Pipe Dream Records). More details to come. Plans for New Year's Eve? Before heading off to the Caribbean, we'll be playing a string of acoustic and electric dates, leading up to a final Caribbean warm up show December 31 at the Matterhorn (on the Mountain Road in Stowe, VT). Segments of Coral Bay were recorded at the Matterhorn, with Mike Gordon, Vassar Clements and Buddy Cage lending us a hand. No surprise, the Matterhorn has remained one of our favorite places to play. As we get closer to New Year's Eve, you'll want to return to the Jalapeno site for ticket giveaways and information on a very special grand prize giveaway: we're sending a couple of our fans on an all-expenses-paid vacation with us during the "Baked in the Sun" Tour 2004! Two lucky people will be packing to join us on the first leg of our annual Caribbean run, getting baked in the sun with us on St. John and St. Thomas. You'll enjoy an after-show party and a limo ride (with the band) that will drop you off at Logan Intn'l airport in Boston. The trip includes round-trip air fare, hotel accommodations and car rental. You'll want to check back for details on this very special trip. Feel free to pass this info on to a friend! As always, we love to hear from our fans. Drop us a line at jalapenobros@yahoo.com and say hello! L to R: Buddy Cage (New Riders), Vassar Clements (Old & In The Way), Glen Schweitzer (J. Bros) and Jay Catalano (J. Bros). 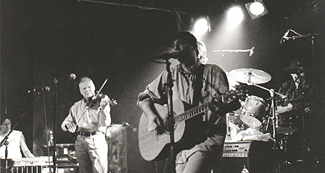 Jalapeno Brothers and Friends, appearing at Higher Ground Music Hall, Winooski, VT, March 1999. Photo courtesy of Jeff Chico. You can now place your order for our new album through the website. Click for more details. We're now booking shows for the weeks ahead. For details on how to book the Jalapeno Brothers, please click here.